When Mike and I were in San Francisco, Madeline and Rigby stayed with my parents. I wasn’t ever worried about either of them, which was nice, but I missed my girls terribly! I didn’t want my parents to think I wasn’t confident in their baby care abilities, so I tried my best not to call every five seconds. I think that backfired, though, because at one point my mom emailed me basically saying, “wtf? Why haven’t you called?” Clearly I needed to find a balance. Maddie did not miss us one bit. I am certain that, despite my mom’s assurances otherwise, Maddie was totally spoiled. Held all the time, played with during every waking second, and toys galore. That’s what grandparents are for, right? Not to mention getting to watch Dodger Games every day. During one of my infrequent calls, I asked my mom if she was giving Maddie lots of tummy time. People! She hadn’t ever rolled from her stomach to her back before! When I said as much to my mom, she said, “Well, now she does! Don’t worry – you’re not missing anything!” I know she and my dad totally high-fived that they were the ones to witness this first. And she still hasn’t rolled from her stomach to her back since we’ve been home. So, either my mom is trying to make me crazy or Maddie is playing hard to get. The craptastic old hospital that Maddie spent the first 10 weeks of her life in (plus two more a few months later) finally closed the last weekend of June. Despite how much I hated how run-down the place had become, I was surprised by how nostalgic I felt about the move into the new hospital. From what I hear, a lot of the doctors and nurses felt the same way. I’ve been morose about everything lately, so I figured a good way to make myself feel better would be to go see the new hospital and visit some of Maddie’s angels – the awesome nurses who took such amazing care of her. Maddie and I headed over to the new hospital tonight, and it was really amazing. There is a separate entrance for the Children’s Hospital, and everything is sparkling new, clean, and – if you’ve been in a hospital you know what I mean – it smelled GOOD. Not hospital-like. It was strange to walk into the hospital and not know where to go. Luckily, some med students sent me in the right direction, and soon enough Maddie and I strolled into the NICU, where we met one of our favorite nurses, Nancy. Nancy was there the night Maddie was born and became one of her primary nurses. Nancy showed us around the new NICU – it is fancy . Sprawling, slick, and super high-tech. I would have felt very confident walking into that NICU as a new parent. Labor and delivery is attached to the NICU – very important should Mike and I ever decide to have another child, as I have to have another c-section. I’ll feel better knowing such awesome people are only steps away. Anyway, point being, new hospital = well planned and brilliantly executed. You know, now that it is FINALLY open. Maddie was a little overwhelmed by all the people and the new environment, but after a rough start she warmed up and started smiling at everyone. I felt bad – when Nancy first came to greet us, she’d just rubbed antibacterial gel on her hands. It has a very distinct smell, and the moment Maddie got a whiff of it, she started crying. She totally knows what that smell means, and it was so sad. I managed to calm her down after a couple minutes of hugs and kisses. It was really great to catch up with Nancy and the other nurses. I was so glad to see them under happy circumstances, and I enjoyed showing off the strides Maddie has made in the six months since her NICU discharge. Nancy pointed out that it’s a big morale booster for a NICU graduate to come back, so I really hope that’s true. I would do ANYTHING for those nurses. KISS' NEW LEAD SINGER…MADDIE!KISS' NEW LEAD SINGER…MADDIE! She knew the smell…. that smell will forever haunt me. The antibacterial dispenser/foam that I had to rub on myself every 2 minutes, because if I held one baby, I had to wash my hands and go to the next. I am so glad you took Maddie. I thought of doing that muself quite a few times but I wasnt sure if they allowed infants other than the preemies into the NICU bec of germs or whatnot. Willf ind out, bec I def would like to go with the girls. Those nurses are just amazing. LOVE the CHAIRS… IT’s great that you were able to get away & know that your BABY was LOVING EVERY MINUTE OF IT… Hopefully she’s being good now that she’s back home & not expecting the “royal” treatment all the time there too! Did your parents go out & buy those chairs for this past weekend?? That is so good that you went. It’s good for you, and for the nurses to see how well you’re BOTH doing. And very cool that she is rolling (or pretending to for your parents!). Before you know it she’ll be running! Email me if you ever want to chat. I totally need more info on those chairs!! SO CUTE! Here’s hoping Maddie rolls over again soon. Huh, wonder if she is really rolling? Too cute the that grandp’s got to see it but I would be a little hurt too. I hate missing any firsts. My kids didn’t miss me either. What’s up with that? Where’s the gratitude?! And she’ll be rolling over and over and over soon, and it will be driving you crazy ’cause she’ll be getting into everything. Mark. My. Words. Glad you like the new hospital…that has to be a relief in the event of any possible future adorable Spohr babies. Are we going to a Dodger game? Cause I could use a Dodger Dog & a Beer. With you. That picture of her lounging in the chair is about the cutest thing I’ve ever seen. I’m not even sure I could be in the same room as Maddie without my head exploding from the levels of CUTE. Happy to hear the new hospital is open. I haven’t been to the big children’s hospital here but I’ve been told it’s a really amazing facility. We’re going to be fundraising for them next year at work. I’m pretty sure Ben would soon forget me should I disappear (and he’s almost 7! ), but Alex would have a tougher time. This is what I tell myself to comfort myself. i’m sure they were thrilled to pieces to see Maddie. Love the chairs and how Maddie and Rigby are so totally kicked back and relaxed. They’re adorable. As for the tummy roll? Find out what kind of flooring your mother has and install it immediately and see if that makes a difference. If it doesn’t then return it to the company stating a “defect” because your daughter won’t roll on it. I’m sure they’ll give you back your money. OMG that picture is so fantastic! She has such a face! 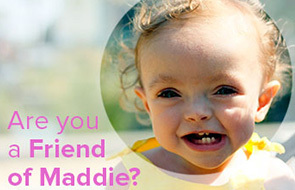 Maddie sure looks liek she had a great time – her little recliner is even nicer than mine! I had a couple of labor and delivery “angels” and thank God for them. I bet seeing Maddie made their hearts smile! And yeah for the new hospital! Right before Captain Crazy was born our town’s new Birthing Center opened up and it was AWESOME -almost like going to a spa – but without hot stone massages, lavendar facials, or good food. We went back to the hospital a few days after my son had recovered from a bad accident, partly to overcome his fear of hospitals and partly to thank the staff for doing such a great job. They were really surprised. I was really surprised that more people don’t. How nice you went to visit the nurses under such happy circumstances! I’m sure they were thrilled to see her!! That must be such a hard and emotional job and to see a success story like Maddie must be the best feeling for them. It’s kind of cute that she saved a “first” just for your parents! She looks really happy in her little chair! wow she is rolling over! so neat, too bad you haven’t seen it yet!! That is great that you saw some of the nurses and that Maddie enocuraged them! Alicias last blog post..Let the cheerleading continue! i can see how she was spoiled. those chairs are killer!!! Awww, poor little thing is all Pavlovian about hand sanitizer. I did my first cartwheel in YEARS for you. Just my way of me showin you how speeshul you are to me. moosh in indy.s last blog post..moments. My mother watches the boys during the day and always gets to see the “firsts.” I make her take photos and shoot footage with the video camera to prove it, and so I can watch it when it’s still new too@! okay, that pic of maddie and rigby in the chairs is just totally awesome. i think they were actually plotting against you. you can see maddie leaned in to give rigby a whisper out of the side of her mouth. The picture of your girls in the chairs is lusciously cute! Can I just steal a few and put them up on my site and tell people this is my new adopted child? Too much. How wonderful for you to get a new, beautiful hospital. But I do know what you mean about the nostalgia of the old one. Our hospital is building a new one and I’m in my comfort zone in our current place, something about the big change makes me drag my emotional feet. I caught Peyton playing with her buildabears the other day, she had them lined up and was giving them all shots in their “ports” and giving them iv’s. It hurts, but they do adjust…sad as that is…and they learn their own ways of controlling the events around them. You’re such a good mommy, you are going to help her find her way through it. I’d love to revisit the NICU where my son spent his first 3 weeks, but we didn’t have much opportunity (it was 3 hours away from home– a long trip behind an ambulance that night) before we moved out of state. I get what you mean about the sights, smells, memories, and people. And those pictures of your baby in the chair are hilariously adorable. Can she come hang out at our house? It would be some kind of cute carnival. I totally understand.. I don’t want my parents to think I don’t trust them – but it’s so hard to be away, and I was separated from Faith when she was sick constantly when she was a baby. I’m glad I got to be with you and spend time with you in person – but I’m glad you’re back with your baby. I hope we can find a way to get together before next year. The pictures are precious. hollis last blog post..The Sisterhood of BlogHer. I loved the picture of Maddie watching the Dodger’s game. Hilarious! Can’t imagine seeing the old place close down and transition to a new one. Sounds like you guys have had an amazing year. What a beautiful little girl you have.